The Beautiful Octopus club night comes to the Albany Theatre every 2 months. They are very accessible. Or you could relax or have a massage in the 'chill-out' Zen Room. Beautiful Octopus Club opens at 7:00pm and finishes at 12:00pm. Beautiful Octopus Club tickets cost £6 or £5. Squidz Club tickets cost £2. Ask the Octopus Club about concessions when you book your ticket. A cup of tea in the cafe costs around 60p. A pint of beer from the bar costs £2.50. A burger in a bun with fat chips & sauce costs around £3.50. Call 0208 692 4446 to book tickets for Beautiful Octopus Club and Squidz Club. Booking tickets is a good idea - they often sell out. Nearest landmark: The Octopus club is in the Albany theatre building. You can generally park outside on Watson Street. In the daytime it is a pedestrian area but you can park there in the evening. 53, 177, 225, 453, 47 are the nearest mobility buses. N47, N53 and 453 are the night buses. (East London Line) New Cross Station is about 500 metres from the Albany Theatre. New Cross Station is not accessible for wheelchair users. Deptford Bridge Station is about 560 metres from the Albany Theatre. Deptford Bridge Station is accessible for wheelchair users. Deptford Station is about 160 metres from the Albany Theatre. Deptford Station is not accessible for wheelchair users. Greenwich Station is the nearest accessible station. It is about 1260 metres from the Albany Theatre. The entrance into the club is flat with wide double doors. There are always people at the door to greet you. The venue is very accessible and welcoming for everyone. 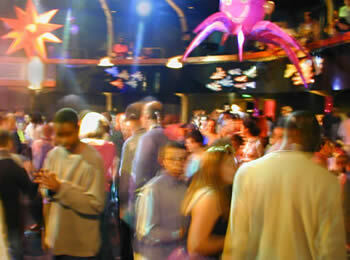 The entrance to the dance floor is through the main entrance. There is lots of good seating, the chairs and tables are not fixed to the floor. The stage has ramps so it is accessible for everyone at open mic' time. The café is on the ground floor. The minimum door widths are 890mm. There is an accessible lift to the bar upstairs. The lift door width is 890mm. There are fully accessible toilets in unisex areas on the ground floor. They are not locked. They have good colour contrasts. Staff are very happy to help. The Albany theatre have music, drama and dance workshops on each week, follow this link to go to their site.